Deco Mache is the brand name for a range of decoupage products. Objects are decorated by sticking the special decorative paper to the surface. It's a pretty twist on the old techniques of papier mache and decoupage. Click here to find out how to get started with our Deco Mache tutorial. Designed for the modern style of decoupage, Deco Mache produce a sophisticated range of decorative papers. Thin, strong and flexible, the Deco Mache papers can be used to decorate a wide range of surfaces. 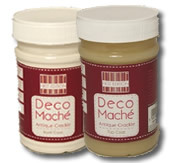 Deco Mache also produce a range of glue-varnishes. The varnishes are non-toxic and water resistant. As well as the more standard gloss and matt finishes, Deco Mache produce an antique crackle glaze varnish. It is a 2 part system - a base coat and a top coat. 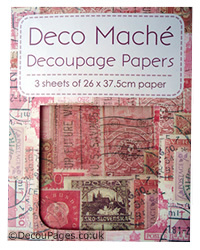 Decopatch, Deco Nouveau and Artepatch are all brand names to look out for when searching for Decopatch papers.